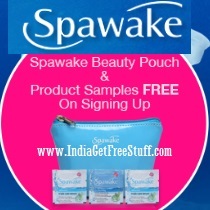 Grab Spawake Free Samples of skincare products and Beauty pouch. Just sign up at the website using the steps provided below and Indulge in the magic of sea spa by using these awesome products for free. Get these free samples delivered at your doorsteps. The products you will get is a Leather Pouch and 3 Sachets of products. Visit Offer page here to make a request. Fill the form with Name, DOB, Mobile Number etc and provide valid address for shipment. Re-check the details you have entered and click submit. It is a skin care product brand by KOSE Corporation.The name ‘Spawake’ denotes the awakening of natural skin beauty with Sea Spa, a beauty treatment enriched with the goodness of sea. Spawake offers the most sensuous range of skincare products, from the heart of beauty -The Sea. Developed from the sea-sourced natural Sea Weeds and active ingredients under advanced Japanese technologies, these offer effective and replenishing skincare solutions. So, indulge yourself everyday with our variety of sea rich products and flaunt a fresh, after-spa glow. Get these Spawake Free Samples now.